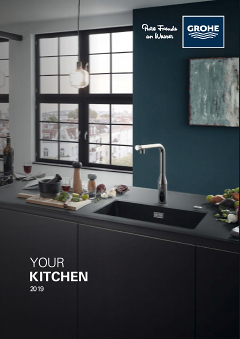 This GROHE Eurosmart kitchen tap will be a helpful new feature in your kitchen. The 140°C swivel spout gives you the range you need to work in, while ensuring the spout won't bump into adjacent cupboards or walls. GROHE SilkMove technology lets you vary water temperature and flow with ease and precision. The Easy Exchange Mousseur system means that when it comes time to clean or replace the aerator you simply unscrew it with a coin. Presented in GROHE StarLight chrome, this sink mixer has a hard-wearing, dazzling lustre, meaning it will be an aesthetic focal point of your kitchen. And the separate internal waterways mean you will enjoy pure, clean drinking water.